Classic comfort that never fails to satisfy my crowd. Bring 6 quarts of water to a boil in a large pot and add 3 tablespoons of kosher salt. Meanwhile. combine the oil and the garlic in a large pot and cook, stirring, over medium-high heat until the garlic is softened, about 1 minute. Add wine, red pepper flakes, and clams, shaking the pot occasionally, until the clams open, about 5 minutes. Transfer the clams to a bowl as they open. Remove the pot from the heat. Drop the pasta into the boiling water and cook until just al dente. Drain, reserving about 1/2 cup of the pasta water. Add the pasta and 1/4 cup of the reserved pasta water to the clam broth and stir and toss over medium heat until the pasta is well coated (add a splash or two more of the reserved pasta water if necessary to loosen the sauce). Stir in the clams, with their juice, and toss until just heated through. Stir in the parsley and serve immediately. Recipe is taken from Mario Batali's Molto Gusto cookbook. 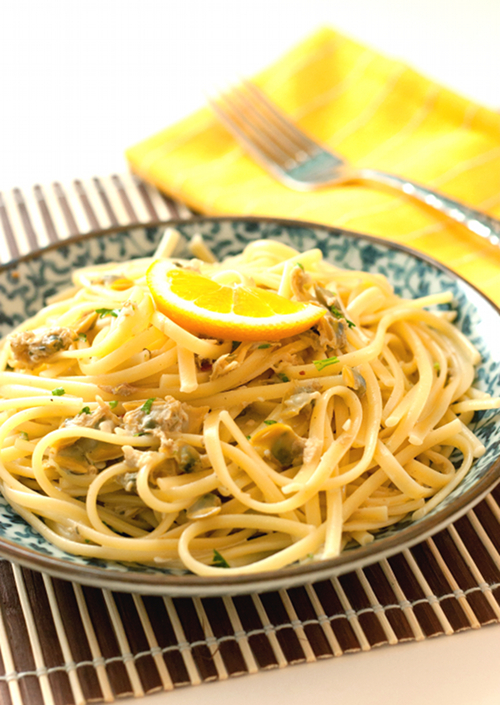 It's difficult to go wrong with linguine and clams. Very nice!